Do you love cars, speed, technology, and telling great stories about those things? Are you a fast, smart, creative writer with a commitment to truth and kicking the asses that need to be kicked? Do you waste your entire work day on Jalopnik as it is? My friend, we want to talk to you. 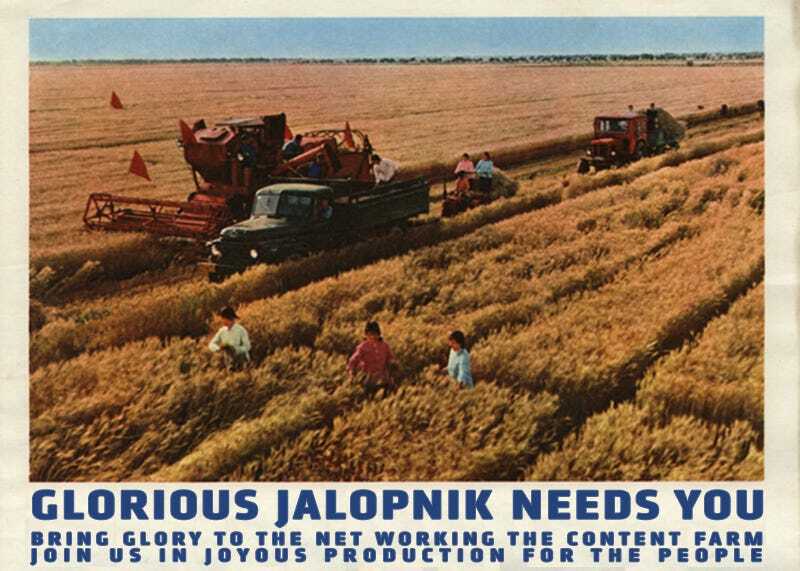 Jalopnik has two entry-level writer positions that need to be filled immediately. These are full-time jobs with competitive salaries and good benefits working out of Gawker Media’s New York mothership, where you will write stories, star in videos, go on wildly ill-advised adventures, and bring our audience of more than 8 million global monthly readers the compelling and intelligent stories they deserve. If you’re looking for a fun place to spend the daily grind, and you’re willing to join a team of the hardest-working writers in automotive journalism, tell us why you’d make a good addition to the squad. This person will be comfortable researching and writing about anything in the greater wheelhouse of transportation, from classic Citroëns to the latest news about Tesla Motors to space travel. The ideal candidate will be a fast, flexible, knowledgeable journalist with a sense of humor who isn’t just into cars and the things that move us, but is first and foremost someone who loves to write with a passion for making those topics fascinating to a general audience. In short, we are not seeking a car nerd—we are seeking a car evangelist. This writer will be responsible for turning out original, engaging stories that complement and expand on Jalopnik’s honest, enthusiastic and even scathing editorial voice. It’s a job for someone who can write multiple stories a day and also budget time for enterprise work. Have at least one year of experience at a news website, blog, magazine or newspaper, although not necessarily one with an automotive focus—many of Jalopnik’s top writers have come from other backgrounds. Have strong news judgement and the ability to respond quickly to cultural and current events with appropriate stories. Be someone who is comfortable turning out a great deal of work, and can balance daily news with larger breakout features. Be organized, detail-oriented, ambitious and comfortable at a website with a massive audience. Fit into Jalopnik’s no-holds-barred approach to covering the auto industry and other topics. Have video experience, whether in production, on camera or editing. Reporting experience is greatly preferred. The automotive landscape of the 21st century will be a very different one than the century that preceded it. Autonomous vehicles, ride-hailing apps and new approaches to mobility may redefine the way we get around. This reporter energetically will cover those trends from a critical perspective and a focus on the rapidly transforming transportation industry. At the same time this reporter will also cover the fast-moving world of modern defense, from unmanned aerial vehicles to cyber warfare, for the Foxtrot Alpha vertical. This beat cuts across a wide swath of tech coverage, but always stays focused on where they might intersect. The ideal applicant is an aggressive self-starter with tremendous institutional and historical knowledge about defense, a strong understanding of all forms of technology, and a keen interest in emerging transportation trends. This reporter has a smart, critical, skeptical outlook on what they cover, a healthy distrust of institutions and an insatiable hunger for the truth, and possesses a deep understanding of military technology—and can explain it to a mass audience in a compelling way. Duties of this reporter include but are not limited to blogging about defense and transportation trends; covering breaking news; developing longer and enterprise features; and be Jalopnik’s primary voice on the future of mobility. I’ll say that in addition to these staff writer jobs, we are always looking for possible contributors, including new columnists. You don’t even have to own a Ferrari 360 to apply, though gated manual ownership is preferred. If you have any questions, drop ‘em in the comments or email me directly at patrick at jalopnik dot com. We look forward to talking with you!